Every good DIYer or crafter knows that they need an arsenal of tools… okay, some tools we need more than others, but new crafting tools are one of life's guilt free pleasures… and unlike swim suit shopping, there's no changing room required. That's a definite win in my book. 1. Quilter's Ruler This has to be the most used tool in my Art Room. I love how it's see through and has tiny hatch marks so you can create a perfectly sized border around whatever you are cutting. 2. E6000 Why burn your fingers with a hot glue gun when you've got E6000? Seriously. This glue works on just about any surface (wood, leather, plastic, ceramics, anything) and dries clear. 3. Fiskar's Rotary Cutter I use this any time I need to be careful with straight cuts, plus I love that you can easily slip out the straight blade & replace it with a patterned blade. The fact that it has a ruler attached to it just makes life a lot simpler. 4. PowerShot Stapler I use this for reupholstery projects, making frames, you name it. The PowerShot works, by far, the best and doesn't wear out your hand like other models do. 5. Xacto Knife & Self Healing Mat I think I use an Xacto knife almost daily. Seriously. I bought a huge 3'x3' self healing mat which lies on the table in my art room so I don't have to worry about cutting through to the table - well worth the investment. 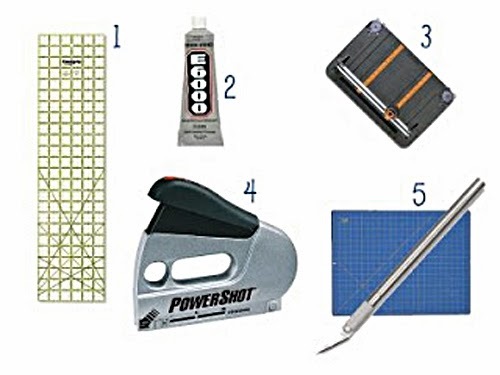 What tool would make your Top 5 DIY Tools?